1. Quarter or halve the strawberries, depending on size, and put in a saucepan with the raspberries and blackberries. 2. Add the sugar and heat gently. Cook for 4-5 minutes, stirring frequently, until the sugar is dissolved and the fruits are soft but still retain some of their shape, and there are plenty of juices in the pan. 3. Use about 6 slices of the bread to line the base and sides of a 1.2 litre pudding basin. Cut and trim the slices so the basin is lined in a fairly even layer with no gaps. Using a ladle, drain off 150ml of the juice from the fruit and reserve. Ladle the fruit and remaining juice into the basin and cover with the remaining slices of bread, cutting to fit. 4. Cover with a saucer that fits just inside the rim of the basin and weigh down with a heavy kitchen weight or food cans weighing about 1kg. Chill overnight. 5. 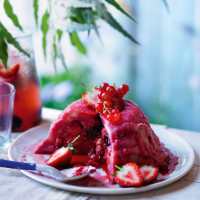 Turn the pudding out onto a serving plate and pour over the reserved juices, then garnish with extra strawberries and a sprig of redcurrant. Serve cut into wedges with a spoonful of clotted cream or single cream poured over.